These are the issues, to resolve which the Subscription plugin was written! It adds the universal subscription form to the sidebar of the project (see the screen to the right). Using this form you can now easily choose project events of your interest and quickly subscribe to them without leaving the page. 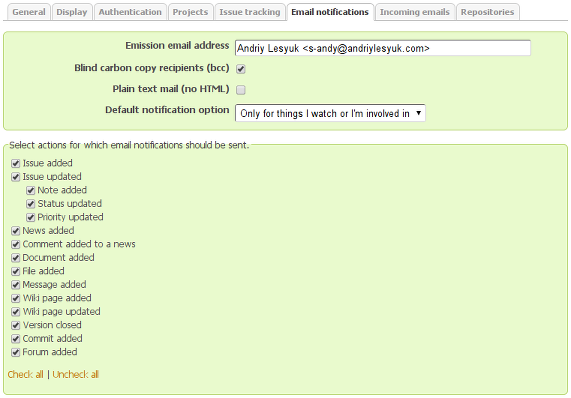 The same form also lets you change the list of events, you want to be notified about, or even completely unsubscribe. Just for the case, if you wondered about the term – i.e., why did I choose the term “subscription”: Watching, which is already available in Redmine, is usually applicable to already existing objects. Thus, you can watch Wiki pages (be notified about changes made to the page), issues (be notified about changes in the issue), forum topics (be notified about new replies), and so on. Subscribing is different as it allows to be notified about new objects (closed version is a new release and closed issue is a new fix)! For Redmine administrators and project managers the plugin provides comprehensive means for controlling, which project objects users will be able to subscribe to. Unfortunately, this automatically makes the plugin configuration a little bit complicated. 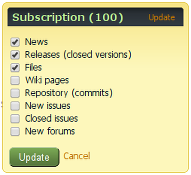 From this list the Subscription plugin uses : “Issue added”, “Issue updated” → “Status updated”, “News added”, “File added”, “Wiki page added”, “Version closed”, “Commit added” and “Forum added”. Generally, it’s fine to enable all these actions. The Subscription plugin does not send any notifications to users, who have the “No events” option chosen in their profiles, so it’s also recommended to change the “Default notification option” to some other value here. Users of roles, for which this permission has not been enabled, won’t see the subscription form at all. Users of roles, for which the “View number of subscribers” permission has been enabled, will also be able to see how many subscribers the project already has. This number is shown in parentheses in the title of the subscription form. That’s (almost) all about the control administrators have over subscriptions. Now let’s see, what control do project managers have. If this module is enabled, the subscription form is shown for the project. If it’s disabled – no project subscription is possible! This is a quick way to disable project subscription for the particular project. To enable the Subscription module for new projects by default you can enable the Subscription checkbox in Administration → Settings → Projects tab. Certainly, project events, for which the Subscription plugin can send notifications and for which appripriate items are shown in the subscription form, depend on availability of corresponding project modules. I.e., if the appropriate module is not enabled for the project, the subscription item is not shown and notifications are not sent. Thus, the following project modules are used by the plugin: “Issue tracking”, “News”, “Files”, “Wiki”, “Repository” and “Forums”.